The heart of this circuit is the LM3914 from national semiconductors. The LM3914 can sense voltage levels and can drive a display of 10 LEDs in dot mode or bar mode. The bar mode and dot mode can be externally set and more than one ICs can be cascaded together to gat an extended display. The IC can operate from a wide supply voltage (3V to 25V DC). The brightness of the LEDs can be programmed using an external resistor. The LED outputs of LM3914 are TTL and CMOS compatible. In the circuit diagram LEDs D1 toD10 displays the level of the battery in either dot or bargraph mode. Resistor R4 connected between pins 6,7 and ground controls the brightness of the LEDs. Resistors R1 and POT R2 forms a voltage divider network and the POT R2 can be used for calibration. The circuit shown here is designed in order to monitor between 10.5V to 15V DC. The calibration of the circuit can be done as follows. After setting up the circuit connect a 12V DC source to the input. Now adjust the 10K POT to get the LED10 glow (in dot mode) or LEDs up to 10 glow (in bar mode). Now decrease the voltage in steps and at 10.5 volts only LED1 will glow. Switch S1 can be used to select between dot mode and bar graph mode. When S1 is closed, pin9 of the IC gets connected to the positive supply and bar graph mode gets enabled. When switch S1 is open pin9 of the IC gets disconnected to the positive supply and the display goes to the dot mode. With little modification the circuit can be used to monitor other voltage ranges. For this just remove the resistor R3 and connect the upper level voltage to the input. Now adjust the POT R2 until LED 10 glows (in dot mode). Remove the upper voltage level and connect the lower level to the input. Now connect a high value POT (say 500K) in the place of R3 and adjust it until LED1 alone glows. Now remove the POT, measure the current resistance across it and connect a resistor of the same value in the place of R3. The level monitor is ready. 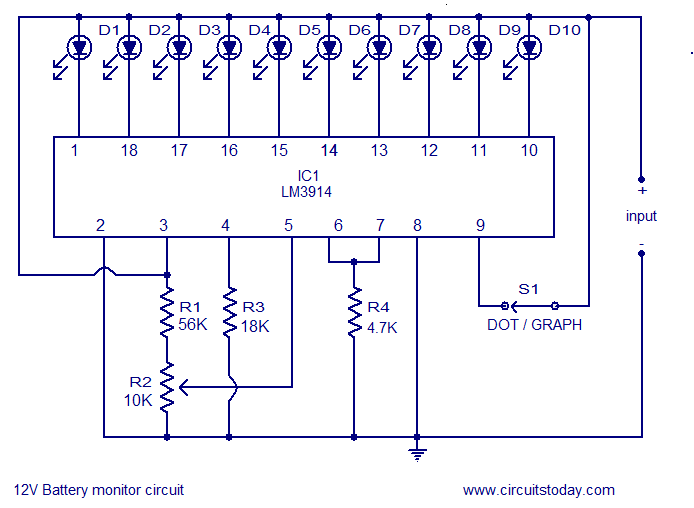 Circuit diagram of battery level indicator using LM3914. 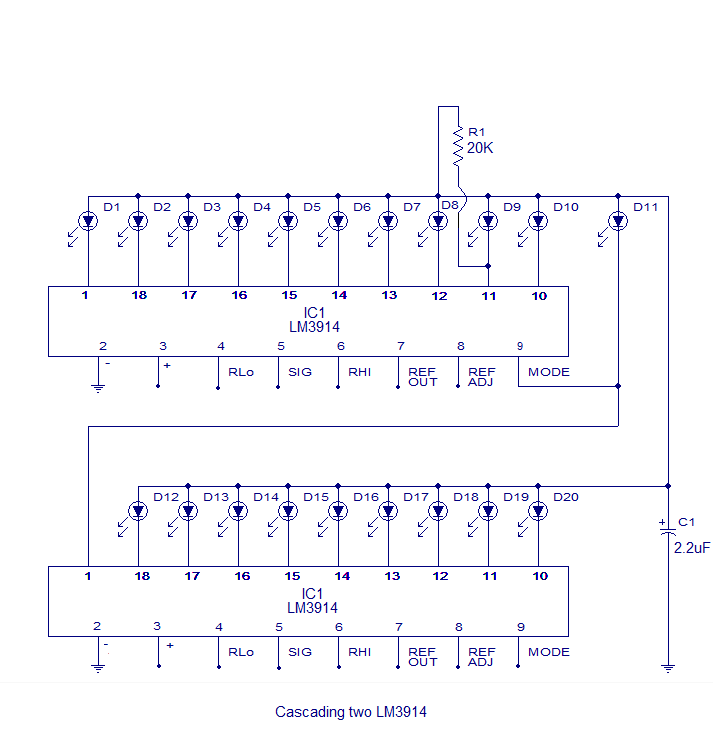 Two or more LM3914 ICs can be cascaded together to get anÂ extendedÂ display. The schematic of two LM3914 ICs cacaded together to get a 20 LED voltage level indicator is shown below. Few other battery level related circuits that you may like. 1.Simple battery level indicator : This circuit can be used for monitoring the level of 3V batteries. The circuit is based on MN13811G from Panasonic. MN13811G is a CMOS Â voltage detector IC that can be used a variety of voltage monitoring applications. In the circuit LED D1 will flash when ever the battery voltage drops below 2.4 volts. 2.3 LED battery level indicator : A 3 LED battery level indicator that can be used for monitoring the voltage level of 12V automobile battery is shown here. Three states of the battery ie; below 11.5V, between 11.5 and 13.5 and above 13.5 are shown by the glowing of LEDs. 3. Flashing battery monitor : This circuit can be used for monitoring the voltage level of 6 to 12V batteries. The circuit is based on transistors and the voltage level at which the LED starts flashing can be adjusted by using a potentiometer. for 24V battery indicator system, what voltage I should set/connect to input to calibrate for lower voltage? Can I just set the voltage that I want to represent as low and adjust the pot R3 to get the new R3? Thank you for the information provided. hi buddy ..I am looking for a circuit with a screen that indicate status of battery..please respond quickly. can the lm3914 be adjusted for a voltage range of 13 to 13.4 or is this to narrow? ie all leds on at 13.4 and all off at 13 reducing the number of leds on as the voltage drops. I believe this would be dot mode. Not sure what is meant by bar mode? can somebody tell me if lm3914 works for this range before I buy the chip. thanks. Hi sir,yes your circuit are helpful. you plz help with a circuit diagram of inductive charging. Charge 12v,7a/h lead acid battery. Your help will highly appreciated. Can lm 3915 be used in d circuit? Your circuits are great & really helpful. Could you help me in building a circuit for 24VDC battery? I built the 12V battery status LED indicator as mentioned above for my own use and would like to incorporate a buzzer to indicate when the battery has reached a certain voltage. Also, is it possible to add a silence button in case the buzzer goes off? The buzzer can be continuous or intermittent. I am a novice building these projects for fun, so I’m not too familiar with all electrical components. The SMPS will work from AC Main supply to power the Motherboard & will charge the 12 Volt battery, when the power supply fails automatically the 12 volt battery will power the Mother board. (Needed the SMPS will out put in 2 voltages 5 & 12 volt that should not change). This will eliminate the requirement of external UPS & the DC to AC conversion can be avoided. Dear Sir, first of all i really appreciate your brilliant support and quick response. please help me how to modify this circuit for 6v 4.5ah SLA battery with minimum voltage 5.7v and maximum 7v. hello sir.. I also need an indicator for 6V battery. I do not understand how to design the circuit by the reading the datasheet. could you please help me. Your help would be greatly appreciated if you could post a schematic of the circuit. PLEASE help me..
And also i have used lm3915.is this a problem ? I want to use this at 12v 7.0 amp/hr battery used as a solar charger. How do you connect the 10k preset. It has 3 pins. Can this circuit to monitor a Li-Ion battery powerpack? Maybe a 5 led simple diagram indicator would be more appropriate. I’d like to use this circuit to monitor 2 12v batteries wired in series. How would I need to alter the circuit to accommodate this? Hi Dan fabricate two numbers and use one for each battery.